The aggregate market value of the registrant’s common units held by non-affiliates on March 31, 2018 was approximately $467,138,000. As of November 30, 2018, the registrant had 52,755,392 common units outstanding. This Annual Report on Form 10-K (this “Report”) includes “forward-looking statements” which represent our expectations or beliefs concerning future events that involve risks and uncertainties, including those associated with the effect of weather conditions on our financial performance, the price and supply of the products that we sell, the consumption patterns of our customers, our ability to obtain satisfactory gross profit margins, our ability to obtain new customers and retain existing customers, our ability to make strategic acquisitions, the impact of litigation, our ability to contract for our current and future supply needs, natural gas conversions, future union relations and the outcome of current and future union negotiations, the impact of current and future governmental regulations, including environmental, health, and safety regulations, the ability to attract and retain employees, customer credit worthiness, counterparty credit worthiness, marketing plans, potential cyber-attacks, general economic conditions and new technology. All statements other than statements of historical facts included in this Report including, without limitation, the statements under “Management’s Discussion and Analysis of Financial Condition and Results of Operations” and elsewhere herein, are forward-looking statements. Without limiting the foregoing, the words “believe,” “anticipate,” “plan,” “expect,” “seek,” “estimate,” and similar expressions are intended to identify forward-looking statements. Although we believe that the expectations reflected in such forward-looking statements are reasonable, we can give no assurance that such expectations will prove to be correct and actual results may differ materially from those projected as a result of certain risks and uncertainties. These risks and uncertainties include, but are not limited to, those set forth in this Report under the heading “Risk Factors” and “Business Strategy.” Important factors that could cause actual results to differ materially from our expectations (“Cautionary Statements”) are disclosed in this Report. All subsequent written and oral forward-looking statements attributable to the Company or persons acting on its behalf are expressly qualified in their entirety by the Cautionary Statements. Unless otherwise required by law, we undertake no obligation to update or revise any forward-looking statements, whether as a result of new information, future events or otherwise after the date of this Report. 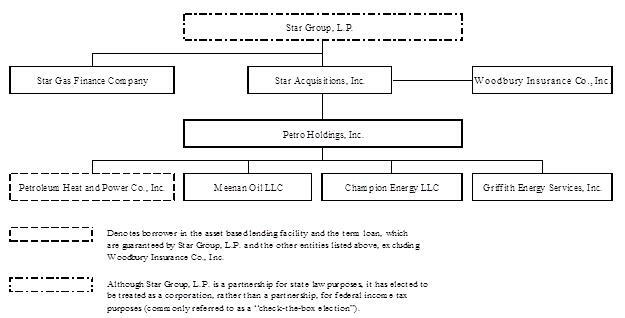 Star Group, L.P. (“Star” the “Company,” “we,” “us,” or “our”) is a home heating oil and propane distributor and services provider with one reportable operating segment that principally provides heating related services to residential and commercial customers. At a special meeting of unitholders held on October 25, 2017, our unitholders voted in favor of proposals to have the Company elect to be treated as a corporation, instead of a partnership, for federal income tax purposes (commonly referred to as a “check-the-box election”), along with amendments to our partnership agreement to effect such changes in income tax classification, in each case effective November 1, 2017. In addition, the Company changed its name, effective October 25, 2017, from “Star Gas Partners, L.P.” to “Star Group, L.P.” to more closely align our name with the scope of our product and service offerings. For tax years after December 31, 2017, unitholders will receive a Form 1099-DIV and will not receive a Schedule K-1 as in previous tax years. Our legal structure will remain a Delaware limited partnership and the distribution provisions under our limited partnership agreement, including the incentive distribution structure will remain unchanged. As of November 30, 2018, we had outstanding 52.8 million common partner units (NYSE: “SGU”) representing a 99.4% limited partner interest in Star, and 0.3 million general partner units, representing a 0.6% general partner interest in Star. Our general partner is Kestrel Heat, LLC, a Delaware limited liability company (“Kestrel Heat” or the “general partner”). The Board of Directors of Kestrel Heat (the “Board”) is appointed by its sole member, Kestrel Energy Partners, LLC, a Delaware limited liability company (“Kestrel”). Our operations are conducted through Petro Holdings, Inc., a Minnesota corporation that is a wholly owned subsidiary of Star Acquisitions, Inc., and its subsidiaries. We file annual, quarterly, current and other reports and information with the Securities and Exchange Commission, or SEC. These filings can be viewed and downloaded from the Internet at the SEC’s website at www.sec.gov. In addition, these SEC filings are available at no cost as soon as reasonably practicable after the filing thereof on our website at www.stargrouplp.com/sec.cfm. You may also obtain copies of these filings and other information at the offices of the New York Stock Exchange located at 11 Wall Street, New York, New York 10005. Please note that any Internet addresses provided in this Annual Report on Form 10-K are for informational purposes only and are not intended to be hyperlinks. Accordingly, no information found and/or provided at such Internet addresses is intended or deemed to be incorporated by reference herein. The following chart summarizes our structure as of September 30, 2018. We are a home heating oil and propane distributor and service provider to residential and commercial customers who heat their homes and buildings in the Northeast, Central and Southeast U.S. regions. Our customers are concentrated in the northern and eastern states. As of September 30, 2018, we sold home heating oil and propane to approximately 454,000 full service residential and commercial customers. We believe we are the largest retail distributor of home heating oil in the United States, based upon sales volume with a market share in excess of 5.5%. We also sell home heating oil, gasoline and diesel fuel to approximately 76,000 customers on a delivery only basis. We install, maintain, and repair heating and air conditioning equipment and to a lesser extent provide these services outside our heating oil and propane customer base including 16,000 service contracts for natural gas and other heating systems. In addition, we provide plumbing to approximately 23,000 customers, many of whom are also existing home heating oil and propane customers. During fiscal 2018, total sales were comprised approximately 65% from sales of home heating oil and propane, 19% from the sale of other petroleum products, and 16% from the installation and repair of heating and air conditioning equipment and ancillary services. We provide home heating equipment repair service and natural gas service 24 hours a day, seven days a week, 52 weeks a year. These services are an integral part of our business, and are intended to maximize customer satisfaction and loyalty. We conduct our business through an operating subsidiary, Petro Holdings, Inc., utilizing multiple local brand names, such as Petro Home Services, Meenan, and Griffith Energy Services, Inc.
We also offer several pricing alternatives to our residential home heating oil customers, including a variable price (market based) option and a price-protected option, the latter of which either sets the maximum price or a fixed price that a customer will pay. Users choose the plan they feel best suits them which we believe increases customer satisfaction. Approximately 96% of our full service residential and commercial home heating oil customers automatically receive deliveries based on prevailing weather conditions. In addition, approximately 34% of our residential customers take advantage of our “smart pay” budget payment plan under which their estimated annual oil and propane deliveries and service billings are paid for in a series of equal monthly installments. We use derivative instruments as needed to mitigate our exposure to market risk associated with our price-protected offerings and the storing of our physical home heating oil inventory. Given our size, we are able to realize certain benefits of scale and provide consistent, strong customer service. million) of the households in the United States where heating oil is the main space-heating fuel and 23% (4.7 million of 20.4 million) of the homes in these regions use home heating oil as their main space-heating fuel. Our experience has been that customers have a tendency to increase their conservation efforts as the price of home heating oil increases, thereby reducing their consumption. The retail home heating oil industry is mature, with total market demand expected to decline in the foreseeable future due to conversions to natural gas, availability of other alternative energy sources and the installations of more fuel efficient heating systems. Therefore, our ability to maintain our business or grow within the industry is dependent on the acquisition of other retail distributors, the success of our marketing programs, and the growth of our other service offerings. Based on our records, our customer conversions to natural gas have ranged between 1.2% and 2.2% per year over the last five years. We believe this may continue or increase as natural gas has become less expensive than home heating oil on an equivalent BTU basis. In addition, there are legislative and regulatory efforts underway in several states seeking to encourage homeowners to expand the use of natural gas as a heating fuel. The retail home heating oil industry is highly fragmented, characterized by a large number of relatively small, independently owned and operated local distributors. Some dealers provide full service, as we do, and others offer delivery only on a cash-on-delivery basis, which we also do to a significantly lesser extent. In addition, the industry is complex and costly due to regulations, working capital requirements, and the costs and risks of hedging for price protected customers. Propane is a by-product of natural gas processing and petroleum refining. Propane use falls into three broad categories: residential and commercial applications; industrial applications; and agricultural uses. In the residential and commercial markets, propane is used primarily for space heating, water heating, clothes drying and cooking. Industrial customers use propane generally as a motor fuel to power over-the-road vehicles, forklifts and stationary engines, to fire furnaces, as a cutting gas and in other process applications. In the agricultural market, propane is primarily used for tobacco curing, crop drying, poultry breeding and weed control. The retail propane distribution industry is highly competitive, and is generally serviced by large multi-state full-service distributors and small local independent distributors. Like the home heating oil industry, each retail propane distribution provider operates in its own competitive environment because propane distributors typically reside in close proximity to their customers. In most retail propane distribution markets, customers can choose from multiple distributors based on the quality of customer service, safety, reputation and price. It is common practice in our business to price our liquid products to customers based on a per gallon margin over wholesale costs. As a result, we believe distributors such as ourselves generally seek to maintain their per gallon margins by passing wholesale price increases through to customers, thus insulating their margins from the volatility in wholesale prices. However, distributors may be unable or unwilling to pass the entire product cost increases through to customers. In these cases, significant decreases in per gallon margins may result. The timing of cost pass-throughs can also significantly affect margins. (See Customers and Pricing for a discussion on our offerings). Pursue select acquisitions Our senior management team has developed expertise in identifying acquisition opportunities and integrating acquired customers into our operations. We focus on acquiring profitable companies within and outside our current footprint. We actively pursue home heating oil only companies, propane companies, dual fuel (home heating oil and propane) companies and selectively target motor fuels acquisitions, especially where they are operating in the markets we currently serve. The focus for our acquisitions is both within our current footprint, as well as outside of such areas if the target company is of adequate size to sustain profitability as a stand-alone operation. We have used this strategy to expand into several states over the past five years. Deliver superior customer service We are dedicated to consistently providing our customers with superior service and a positive customer experience to improve retention and drive additional revenue. We have established a Customer Experience Platform and Voice of the Customer (VOC) Program to effectively measure customer satisfaction at certain brands. VOC refers to a process (or program) designed to capture customers’ preferences and opinions of the service we deliver. The heart of the VOC program is based on transactional surveys with real-time results. We analyze customer input to gain business insights and share this information internally to create meaningful change throughout the company and improve overall customer satisfaction. We have deployed Salesforce.com, a customer relationship management solution, at most of our larger brands. This will allow us to provide a more consistent customer experience as our employees will have a 360 degree-view of each customer with easy access to key customer information and customized dashboards to track individual employee performance. We have resources dedicated to training employees to provide superior and consistent service and enhance the customer experience. We also have a technical training committee to ensure that our field personnel are properly educated in using the latest technology in a safe and efficient manner. This effort is supported, reinforced and monitored by our local management teams. Diversification of product and service offerings In addition to expanding our propane operations, we are focused on expanding our suite of rationally related products and services. These offerings include, but are not limited to, the sales, service and installation of heating and air conditioning equipment, plumbing services, and standby home generators. In addition, we also repair and install natural gas heating systems. We place significant emphasis on growing a solid, credit-worthy customer base with a focus on recurring revenue in the form of annual service agreements. We have begun to offer a subscription-based, personal home concierge service to customers in certain of our geographic locations. This program may be expanded to our entire geographic foot print and to customers for which we currently do not provide any services. The Company is monitoring the expense levels associated with the roll out of the concierge program to determine that the revenues generated from the program justify the additional costs. Geographic expansion We utilize census-based demographic data as well as local field expertise to target areas contiguous to our geographic footprint for organic expansion in a strategic manner. We then operate in such areas using a combination of existing logistical resources and personnel and, if warranted by the business demands or opportunity, adding locations. We grow the business utilizing advertising and marketing initiatives to expand our presence while building an effective marketing database of prospects and customers. Our fiscal year ends on September 30. All references to quarters and years respectively in this document are to fiscal quarters and years unless otherwise noted. The seasonal nature of our business results in the sale of approximately 30% of our volume of home heating oil and propane in the first fiscal quarter and 50% of our volume in the second fiscal quarter of each fiscal year, the peak heating season. Approximately 25% of our volume of other petroleum products is sold in each of the four fiscal quarters. We generally realize net income in our first and second fiscal quarters and net losses during our third and fourth fiscal quarters and we expect that the negative impact of seasonality on our third and fourth fiscal quarter operating results will continue. In addition, sales volume typically fluctuates from year to year in response to variations in weather, wholesale energy prices and other factors. A “degree day” is an industry measurement of temperature designed to evaluate energy demand and consumption. Degree days are based on how far the average daily temperature departs from 65°F. Each degree of temperature above 65°F is counted as one cooling degree day, and each degree of temperature below 65°F is counted as one heating degree day. Degree days are accumulated each day over the course of a year and can be compared to a monthly or a multi-year average to see if a month or a year was warmer or cooler than usual. Degree days are officially observed by the National Weather Service. Every ten years, the National Oceanic and Atmospheric Administration (“NOAA”) computes and publishes average meteorological quantities, including the average temperature for the last 30 years by geographical location, and the corresponding degree days. The latest and most widely used data covers the years from 1981 to 2010. Our calculations of normal weather are based on these published 30 year averages for heating degree days, weighted by volume for the locations where we have existing operations. Most of our operating locations compete with numerous distributors, primarily on the basis of price, reliability of service and response to customer needs. Each such location operates in its own competitive environment. We compete with distributors offering a broad range of services and prices, from full-service distributors, such as ourselves, to those offering delivery only. As do many companies in our business, we provide home heating and propane equipment repair service on a 24-hour-a-day, seven-day-a-week, 52 weeks a year basis. We believe that this level of service tends to help build customer loyalty. In some instances homeowners have formed buying cooperatives that seek a lower price than individual customers are otherwise able to obtain. Our business competes for retail customers with suppliers of alternative energy products, principally natural gas, propane (in the case of our home heating oil operations) and electricity. Our full service home heating oil customer base is comprised of 96% residential customers and 4% commercial customers. Approximately 96% of our full service residential and commercial home heating oil customers have their deliveries scheduled automatically and 4% of our home heating oil customer base call from time to time to schedule a delivery. Automatic deliveries are scheduled based on each customer’s historical consumption pattern and prevailing weather conditions. Our practice is to bill customers promptly after delivery. We offer a balanced payment plan to residential customers in which a customer’s estimated annual oil purchases and service contract fees are paid for in a series of equal monthly payments. Approximately 34% of our residential home heating oil customers have selected this billing option. We offer several pricing alternatives to our residential home heating oil customers. Our variable pricing program allows the price to float with the heating oil market and other factors. In addition, we offer price-protected programs, which establish either a ceiling or a fixed price per gallon that the customer pays over a defined period. The following chart depicts the percentage of the pricing plans selected by our residential home heating oil customers as of the end of the fiscal year. Approximately 2% of the increase in the percentage of accounts under fixed contracts is attributable to fiscal 2017 acquisitions. Sales to residential customers ordinarily generate higher per gallon margins than sales to commercial customers. Due to greater price sensitivity, our own internal marketing efforts, and hedging costs of residential price-protected customers, the per gallon margins realized from price-protected customers generally are less than from variable priced residential customers. The propane customer base has a similar profile of heating oil residential and commercial customers. Pricing plans chosen by propane customers are almost exclusively variable in nature where selling prices will float with the propane market and other commercial factors. The smallest portion of our customer base is devoted to other petroleum products. This customer group includes commercial and industrial customers of unbranded gasoline, diesel, kerosene and related distillate products. We sell products to these customers through contracts of various terms or through a competitive bidding process. We use derivative instruments in order to mitigate our exposure to market risk associated with the purchase of home heating oil for our price-protected customers, physical inventory on hand, inventory in transit, priced purchase commitments, and the variable interest rate on our term loan. Currently, the Company’s derivative instruments are with the following counterparties: Bank of America, N.A., Bank of Montreal, Cargill, Inc., Citibank, N.A., JPMorgan Chase Bank, N.A., Key Bank, N.A., Regions Financial Corporation, Toronto-Dominion Bank and Wells Fargo Bank, N.A. The Financial Accounting Standards Board (“FASB”) Accounting Standards Codification (“ASC”) 815-10-05, Derivatives and Hedging, requires that derivative instruments be recorded at fair value and included in the consolidated balance sheet as assets or liabilities. To the extent our interest rate derivative instruments designated as cash flow hedges are effective, as defined under this guidance, changes in fair value are recognized in other comprehensive income (loss) until the hedged item is recognized in earnings. We have elected not to designate our commodity derivative instruments as hedging instruments under this guidance, and as a result, the changes in fair value of the derivative instruments during the holding period are recognized in our statement of operations. Therefore, we experience volatility in earnings as outstanding derivative instruments are marked to market and non-cash gains and losses are recorded prior to the sale of the commodity to the customer. The volatility in any given period related to unrealized non-cash gains or losses on derivative instruments can be significant to our overall results. However, we ultimately expect those gains and losses to be offset by the cost of product when purchased. Depending on the risk being hedged, realized gains and losses are recorded in cost of product, cost of installations and services, or delivery and branch expenses. We purchase our product for delivery in either barge, pipeline or truckload quantities, and as of September 30, 2018, had contracts with approximately 109 third-party terminal sites for the right to temporarily store petroleum products at their facilities. Home heating oil and propane purchases are made under supply contracts or on the spot market. We have entered into market price based contracts for approximately 80% of our expected home heating oil and propane requirements for the fiscal 2019 heating season. We also have market price based contracts for approximately 29% of our expected diesel and gasoline requirements for fiscal 2019. During fiscal 2018, Global Companies LLC provided approximately 8.4% of our petroleum product purchases. No other single supplier provided more than 8% of our product supply during fiscal 2018. Supply contracts typically have terms of 6 to 12 months. All of the supply contracts provide for minimum quantities and in most cases do not establish in advance the price of home heating oil or propane. This price is based upon a published market index price at the time of delivery or pricing date plus an agreed upon differential. We believe that our policy of contracting for the majority of our anticipated supply needs with diverse and reliable sources will enable us to obtain sufficient product should unforeseen shortages develop in worldwide supplies. On November 30, 2018, the NYMEX ultra low sulfur diesel contract closed at $1.85 per gallon or $0.20 per gallon lower than the average of $2.05 in Fiscal 2018. Part of our business strategy is to pursue select acquisitions. During fiscal 2018, the Company acquired five home heating oil dealers and a motor fuel dealer with a total of 16,950 home heating oil and propane accounts for an aggregate purchase price of approximately $25.2 million; comprised of $23.7 million in cash and $1.5 million of deferred liabilities. The gross purchase price was allocated $15.3 million to intangible assets, $7.5 million to fixed assets and $2.4 million to working capital. Each acquired company’s operating results are included in the Company’s consolidated financial statements starting on its acquisition date. Customer lists, other intangibles and trade names are amortized on a straight-line basis over seven to twenty years. During fiscal 2017, the Company acquired four home heating oil dealers, two propane dealers and a plumbing service provider with a total of 28,300 home heating oil and propane accounts for an aggregate purchase price of approximately $44.8 million; comprised of $43.3 million in cash and $1.5 million of deferred liabilities (including $0.6 million of contingent consideration). The gross purchase price was allocated $37.5 million to intangible assets, $10.2 million to fixed assets and reduced by $2.9 million in working capital credits. Each acquired company’s operating results are included in the Company’s consolidated financial statements starting on its acquisition date. Customer lists, other intangibles and trade names are amortized on a straight-line basis over seven to twenty years. During fiscal 2016, we acquired a heating oil dealer, a motor fuel dealer, and two propane dealers with a total of 3,300 home heating oil and propane accounts for an aggregate purchase price of approximately $9.8 million. The gross purchase price was allocated $7.4 million to intangible assets, $2.5 million to fixed assets and reduced by $0.1 million for working capital credits. As of September 30, 2018, we had 3,403 employees, of whom 927 were office, clerical and customer service personnel; 915 were equipment technicians; 542 were fuel delivery drivers and mechanics; 642 were management and 377 were employed in sales. Of these employees 1,463 (43%) are represented by 57 different collective bargaining agreements with local chapters of labor unions. Due to the seasonal nature of our business and depending on the demands of the 2019 heating season, we anticipate that we will augment our current staffing levels during the heating season from among the 380 employees on temporary leave of absence as of September 30, 2018. There are 13 collective bargaining agreements up for renewal in fiscal 2019, covering approximately 310 employees (9%). We believe that our relations with both our union and non-union employees are generally satisfactory. We are subject to various federal, state and local environmental, health and safety laws and regulations. Generally, these laws impose limitations on the discharge or emission of pollutants and establish standards for the handling of solid and hazardous wastes. These laws include the Resource Conservation and Recovery Act, the Comprehensive Environmental Response, Compensation and Liability Act (“CERCLA”), the Clean Air Act, the Occupational Safety and Health Act, the Emergency Planning and Community Right to Know Act, the Clean Water Act, the Oil Pollution Act, and comparable state statutes. CERCLA, also known as the “Superfund” law, imposes joint and several liabilities without regard to fault or the legality of the original conduct on certain classes of persons that are considered to have contributed to the release or threatened release of a hazardous substance into the environment. Products stored and/or delivered by us and certain automotive waste products generated by our fleet are hazardous substances within the meaning of CERCLA or otherwise subject to investigation and cleanup under other environmental laws and regulations. While we are currently not involved with any material CERCLA claims, and we have implemented programs and policies designed to address potential liabilities and costs under applicable environmental laws and regulations, failure to comply with such laws and regulations could result in civil or criminal penalties or injunctive relief in cases of non-compliance or impose liability for remediation costs. We have incurred and continue to incur costs to address soil and groundwater contamination at some of our locations, including legacy contamination at properties that we have acquired. A number of our properties are currently undergoing remediation, in some instances funded by prior owners or operators contractually obligated to do so. To date, no material issues have arisen with respect to such prior owners or operators addressing such remediation, although there is no assurance that this will continue to be the case. In addition, we have been subject to proceedings by regulatory authorities for alleged violations of environmental and safety laws and regulations. We do not expect any of these liabilities or proceedings of which we are aware to result in material costs to, or disruptions of, our business or operations. Transportation of our products by truck are subject to regulations promulgated under the Federal Motor Carrier Safety Act. These regulations cover the transportation of hazardous materials and are administered by the United States Department of Transportation or similar state agencies. Several of our oil terminals are governed under the United States Coast Guard operations Oversite, Federal OPA 90 FRP programs and Federal Spill Prevention Control and Countermeasure programs. All of our propane bulk terminals are governed under Homeland Security Chemical Facility Anti-Terrorism Standards programs. We conduct ongoing training programs to help ensure that our operations are in compliance with applicable regulations. We maintain various permits that are necessary to operate some of our facilities, some of which may be material to our operations. You should consider carefully the risk factors discussed below, as well as all other information, as an investment in the Company involves a high degree of risk. We are subject to certain risks and hazards due to the nature of the business activities we conduct. The risks discussed below, any of which could materially and adversely affect our business, financial condition, cash flows, and results of operations, could result in a partial or total loss of your investment, and are not the only risks we face. We may experience additional risks and uncertainties not currently known to us or, as a result of developments occurring in the future, conditions that we currently deem to be immaterial may also materially and adversely affect our business, financial condition, cash flows and results of operations. Our operating results will be adversely affected if we continue to experience significant net customer attrition in our home heating oil and propane customer base. The following table depicts our gross customer gains, gross customer losses and net customer attrition from fiscal year 2014 to fiscal year 2018. Net customer attrition is the difference between gross customer losses and customers added through marketing efforts. Customers added through acquisitions are not included in the calculation of gross customer gains. However, additional customer gains that are obtained through marketing efforts and losses at newly acquired businesses are included in these calculations from the point of closing going forward. Customer attrition percentage calculations include customers added through acquisitions in the denominators of the calculations on a weighted average basis from the closing date. The continuing volatility in the energy markets can intensify price competition and add to our difficulty in reducing net customer attrition. Warmer than normal weather can also contribute to an increase in attrition as customers perceive less need for a full service provider like ourselves. Because of the highly competitive nature of our business, we may not be able to retain existing customers or acquire new customers, which would have an adverse impact on our business, operating results and financial condition. Our business is subject to substantial competition. Most of our operating locations compete with numerous distributors, primarily on the basis of price, reliability of service and responsiveness to customer service needs. Each operating location operates in its own competitive environment. We compete with distributors offering a broad range of services and prices, from full-service distributors, such as ourselves, to those offering delivery only. As do many companies in our business, we provide home heating equipment repair service on a 24-hour-a-day, seven-day-a-week, 52 weeks a year basis. We believe that this tends to build customer loyalty. In some instances homeowners have formed buying cooperatives that seek to purchase home heating oil from distributors at a price lower than individual customers are otherwise able to obtain. We also compete for retail customers with suppliers of alternative energy products, principally natural gas, propane (in the case of our home heating oil operations) and electricity. If we are unable to compete effectively, we may lose existing customers and/or fail to acquire new customers, which would have a material adverse effect on our business, operating results and financial condition. Based on data in the 2010 United States Census, from 2000 to 2010 it appears that heating oil customer conversions to natural gas in the states where we do business averaged from under 1% to over 3% per year. The following table depicts our estimated customer losses to natural gas conversions for the last five fiscal years. Losses to natural gas in our footprint for the home heating oil industry could be greater or less than our estimates. We believe conversions will continue as natural gas has become less expensive than home heating oil on an equivalent BTU basis. In addition, certain states encourage homeowners to expand the use of natural gas as a heating fuel through legislation and regulatory efforts. In addition to our direct customer losses to natural gas competition, any conversion to natural gas by a heating oil consumer in our geographic footprint reduces the pool of available customers from which we can gain new heating oil customers, and could have a material adverse effect on our business, operating results and financial condition. Energy efficiency and new technology may reduce the demand for our products and adversely affect our operating results. Increased conservation and technological advances, including installation of improved insulation and the development of more efficient furnaces and other heating devices, have adversely affected the demand for our products by retail customers. Future conservation measures or technological advances in heating, conservation, energy generation or other devices might reduce demand and adversely affect our operating results. If we do not make acquisitions on economically acceptable terms, our future growth will be limited. the assumption of additional liabilities including environmental liabilities. In addition, acquisitions may be dilutive to earnings and distributions to unitholders, and any additional debt incurred to finance acquisitions may, among other things, affect our ability to make distributions to our unitholders. Since weather conditions may adversely affect the demand for home heating oil and propane, our business, operating results and financial condition are vulnerable to warm winters. Weather conditions in the Northeast and Mid-Atlantic regions in which we operate have a significant impact on the demand for home heating oil and propane because our customers depend on this product principally for space heating purposes. As a result, weather conditions may materially adversely impact our business, operating results and financial condition. During the peak-heating season of October through March, sales of home heating oil and propane historically have represented approximately 80% of our annual volume. Actual weather conditions can vary substantially from year to year or from month to month, significantly affecting our financial performance. Warmer than normal temperatures in one or more regions in which we operate can significantly decrease the total volume we sell and the gross profit realized and, consequently, our results of operations. To partially mitigate the adverse effect of warm weather on cash flows, we have used weather hedge contracts for a number of years. In general, such weather hedge contracts provide that we are entitled to receive a specific payment per heating degree-day shortfall, when the total number of heating degree-days in the hedge period is less than the ten year average. The “payment thresholds,” or strikes, are set at various levels. The hedge period runs from November 1, through March 31, of a fiscal year taken as a whole. For fiscal year 2019, 2020, and 2021 we have weather hedge contracts with one provider. For each fiscal year the maximum that the Company can receive is $12.5 million and the maximum the Company may be obligated to pay is $5.0 million. However, there can be no assurance that such weather hedge contracts would fully or substantially offset the adverse effects of warmer weather on our business and operating results during such period or that colder weather will result in enough profit to offset a payment by the Company to its provider. High product prices can lead to customer conservation and attrition, resulting in reduced demand for our products. Prices for our products are subject to volatile fluctuations in response to changes in supply and other market conditions. During periods of high product costs our prices generally increase. High prices can lead to customer conservation and attrition, resulting in reduced demand for our products. Increases in wholesale product costs may have adverse effects on our business, financial condition, results of operations, or liquidity. If increases in wholesale product costs cause our working capital requirements to exceed the amounts available under our revolving credit facility or should we fail to maintain the required availability or fixed charge coverage ratio, we would not have sufficient working capital to operate our business, which could have a material adverse effect on our financial condition and results of operations. Our business requires a significant amount of working capital to finance inventory and accounts receivable generated during the heating season. Under our revolving credit facility, we may borrow up to $300 million, which increases to $450 million during the peak winter months from December through April of each fiscal year. We are obligated to meet certain financial covenants under our Credit Agreement, including the requirement to maintain at all times either excess availability (borrowing base less amounts borrowed and letters of credit issued) of 12.5% of the revolving credit commitment then in effect or a fixed charge coverage ratio (as defined in our Credit Agreement) of not less than 1.1. In addition, as long as our term loan is outstanding, our senior secured leverage ratio cannot at any time be more than 3.0 as calculated during the quarters ending June or September, and cannot at any time be more than 4.5 as calculated during the quarters ending December or March. For certain of our supply contracts, we are required to establish the purchase price in advance of receiving the physical product. This occurs at the end of the month and is usually 20 days prior to receipt of the product. We use futures contracts or swaps to “short” the purchase commitment such that the commitment floats with the market. As a result, any upward movement in the market for home heating oil would reduce our liquidity, as we would be required to post additional cash collateral for a futures contract or our availability to borrow under our Credit Agreement would be reduced in the case of a swap. At December 31, 2018, we expect to have approximately 24 million gallons of priced purchase commitments and physical inventory hedged with a futures contract or swap. If the wholesale price of heating oil increased $1 per gallon, our near term liquidity in December would be reduced by $24 million. At September 30, 2018, we had approximately 129,000 customers, or 34% of our residential customer base, on the balanced payment plan in which a customer’s estimated annual oil purchases and service contract fees are paid for in a series of equal monthly payments. Increases in wholesale prices could reduce our liquidity if we failed to recalculate the balanced payments on a timely basis or if customers resist higher balanced payments. These customers could possibly owe us more in the future than we had budgeted. Generally, customer credit balances are at their low point after the end of the heating season and at their peak prior to the beginning of the heating season. Our hedging strategy may adversely affect our liquidity. We purchase synthetic call options from and enter into forward swaps with members of our lending group to manage market risk associated with our commitments to our customers, our physical inventory and fuel we use for our vehicles. These institutions have not required an initial cash margin deposit or any mark to market maintenance margin for these derivatives. Any mark to market exposure due to reductions in wholesale energy costs reduces our borrowing base and can thus reduce the amount available to us under our Credit Agreement. The highest mark to market reserve against our borrowing base for these derivative instruments with our lending group was $0, $7.8 million, and $25.2 million, during fiscal years 2018, 2017, and 2016 respectively. We also purchase call options to hedge the price of the products to be sold to our price-protected customers which usually require us to pay an upfront cash payment. This reduces our liquidity, as we must pay for the option before any sales are made to the customer. We also purchase synthetic call options which require us to pay for these options as they expire. Sudden and sharp oil price increases that cannot be passed on to customers may adversely affect our operating results. increases to customers through increased retail sales prices. In an effort to retain existing accounts and attract new customers we may offer discounts, which will impact the net per gallon gross margin realized. Significant declines in the wholesale price of home heating oil may cause price-protected customers to renegotiate or terminate their arrangements which may adversely impact our gross profit and operating results. When the wholesale price of home heating oil declines significantly after a customer enters into a price protection arrangement, some customers attempt to renegotiate their arrangement in order to enter into a lower cost pricing plan with us or terminate their arrangement and switch to a competitor. Under our current price-protected programs, approximately 36.9% and 7.9% of our residential customers are respectively categorized as being either ceiling or fixed. A significant portion of our home heating oil volume is sold to price-protected customers (ceiling and fixed) and our gross margins could be adversely affected if we are not able to effectively hedge against fluctuations in the volume and cost of product sold to these customers. A significant portion of our home heating oil volume is sold to individual customers under an arrangement pre-establishing the ceiling sales price or a fixed price of home heating oil over a fixed period. When the customer makes a purchase commitment for the next period we currently purchase option contracts, swaps and futures contracts for a substantial majority of the heating oil that we expect to sell to these price-protected customers. The amount of home heating oil volume that we hedge per price-protected customer is based upon the estimated fuel consumption per average customer, per month. If the actual usage exceeds the amount of the hedged volume on a monthly basis, we could be required to obtain additional volume at unfavorable margins. In addition, should actual usage in any month be less than the hedged volume, (including, for example, as a result of early terminations by fixed price customers) our hedging losses could be greater. Currently, we have elected not to designate our derivative instruments as hedging instruments under FASB ASC 815-10-05 Derivatives and Hedging, and the change in fair value of the derivative instruments is recognized in our statement of operations. Therefore, we experience volatility in earnings as these currently outstanding derivative contracts are marked to market and non-cash gains or losses are recorded in the statement of operations. Our risk management policies cannot eliminate all commodity risk, basis risk, or the impact of adverse market conditions which can adversely affect our financial condition, results of operations and cash available for distribution to our unitholders. In addition, any noncompliance with our risk management policies could result in significant financial losses. While our hedging policies are designed to minimize commodity risk, some degree of exposure to unforeseen fluctuations in market conditions remains. For example, we change our hedged position daily in response to movements in our inventory. Any difference between the estimated future sales from inventory and actual sales will create a mismatch between the amount of inventory and the hedges against that inventory, and thus change the commodity risk position that we are trying to maintain. Also, significant increases in the costs of the products we sell can materially increase our costs to carry inventory. We use our revolving credit facility as our primary source of financing to carry inventory and may be limited on the amounts we can borrow to carry inventory. Basis risk describes the inherent market price risk created when a commodity of certain grade or location is purchased, sold or exchanged as compared to a purchase, sale or exchange of a like commodity at a different time or place. Transportation costs and timing differentials are components of basis risk. For example, we use the NYMEX to hedge our commodity risk with respect to pricing of energy products traded on the NYMEX. Physical deliveries under NYMEX contracts are made in New York Harbor. To the extent we take deliveries in other ports, such as Boston Harbor, we may have basis risk. In a backward market (when prices for future deliveries are lower than current prices), basis risk is created with respect to timing. In these instances, physical inventory generally loses value as basis declines over time. Basis risk cannot be entirely eliminated, and basis exposure, particularly in backward or other adverse market conditions, can adversely affect our financial condition, results of operations and cash available for distribution to our unitholders. these steps will detect and/or prevent all violations of such risk management policies and procedures, particularly if deception or other intentional misconduct is involved. Failure to effectively estimate employer-sponsored health insurance premiums and incremental costs due to the U.S. Patient Protection and Affordable Care Act (the “ACA”) or other healthcare reform laws could materially and adversely affect the Company’s financial condition, results of operations, and cash flows. In March 2010, the United States federal government enacted comprehensive health care reform legislation, which, among other things, includes guaranteed coverage requirements, eliminates pre-existing condition exclusions and annual and lifetime maximum limits, restricts the extent to which policies can be rescinded, and imposes new taxes on health insurers, self-insured companies, and health care benefits. The legislation imposes implementation effective dates that began in 2010 and extend through 2020 with many of the changes requiring additional guidance from federal agencies and regulations. Possible adverse effects could include increased costs, exposure to expanded liability, and requirements for us to revise the ways in which healthcare and other benefits are provided to employees. Efforts to modify, repeal or otherwise invalidate all, or certain provisions of, the ACA and/or adopt a replacement healthcare reform law may impact our employee healthcare costs. Since its enactment, there have been judicial and Congressional challenges to certain aspects of the ACA, and we expect there will be additional challenges and amendments to the ACA in the future. The Trump administration and members of the U.S. Congress have indicated that they may continue to seek to modify, repeal, or otherwise invalidate all, or certain provisions of the ACA. Most recently, the Tax Cuts and Jobs Acts was enacted, which, among other things, removes penalties for not complying with the individual mandate to carry health insurance. At this time, there is uncertainty concerning whether the ACA will be repealed or what requirements will be included in a new law, if enacted. Increased health care and insurance costs as well as other changes in federal or state workplace regulations could have a material adverse effect on our business, financial condition, results of operations and cash flows. Our obligation to fund multi-employer pension plans to which we contribute may have an adverse impact on us. We participate in a number of multi-employer pension plans for current and former union employees covered under collective bargaining agreements. The risks of participating in multi-employer plans are different from single-employer plans in that assets contributed are pooled and may be used to provide benefits to current and former employees of other participating employers. Several factors could require us to make significantly higher future contributions to these plans, including the funding status of the plan, unfavorable investment performance, insolvency or withdrawal of participating employers, changes in demographics and increased benefits to participants. Several of these multi-employer plans to which we contribute are underfunded, meaning that the value of such plans’ assets are less than the actuarial value of the plans’ benefit obligations. We may be subject to additional liabilities imposed by law as a result of our participation in multi-employer defined benefit pension plans. Various Federal laws impose certain liabilities upon an employer who is a contributor to a multi-employer pension plan if the employer withdraws from the plan or the plan is terminated or experiences a mass withdrawal, potentially including an allocable share of the unfunded vested benefits in the plan for all plan participants, not just our retirees. Accordingly, we could be assessed our share of unfunded liabilities should we terminate participation in these plans, or should there be a mass withdrawal from these plans, or if the plans become insolvent or otherwise terminate. While we currently have no intention of permanently terminating our participation in or otherwise withdrawing from any underfunded multi-employer pension plan, there can be no assurance that we will not be required to record material withdrawal liabilities or be required to make material cash contributions in the future to one or more underfunded plans, whether as a result of withdrawing from a plan, or of agreeing to any alternate funding option, or due to any of the other risks associated with being a participating employer in an underfunded plan. Any of these events could negatively impact our liquidity and financial results. We rely on the continued solvency of our derivatives, insurance and weather hedge counterparties. financial condition could be materially adversely impacted, as we would be obligated to fulfill our operational requirement of purchasing, storing and selling home heating oil and vehicle fuel, while losing the mitigating benefits of economic hedges with a failed counterparty. If one of our insurance carriers were to fail, our liquidity, results of operations and financial condition could be materially adversely impacted, as we would have to fund any catastrophic loss. If our weather hedge counterparty were to fail, we would lose the protection of our weather hedge contract. Currently, we have outstanding derivative instruments with the following counterparties: Bank of America, N.A., Bank of Montreal, Cargill, Inc., Citibank, N.A., JPMorgan Chase Bank, N.A., Key Bank, N.A., Regions Financial Corporation, Toronto-Dominion Bank and Wells Fargo Bank, N.A.. Our primary insurance carriers are American International Group, our captive insurance subsidiary, Woodbury Insurance Co., Inc., and our weather hedge counterparty which is a subsidiary of Sompo International. Our operating results are subject to seasonal fluctuations since the demand for home heating oil and propane is greater during the first and second fiscal quarter of our fiscal year, which is the peak heating season. The seasonal nature of our business has resulted on average in the last five years in the sale of approximately 30% of our volume of home heating oil and propane in the first fiscal quarter and 50% of our volume in the second fiscal quarter of each fiscal year. As a result, we generally realize net income in our first and second fiscal quarters and net losses during our third and fourth fiscal quarters and we expect that the negative impact of seasonality on our third and fourth fiscal quarter operating results will continue. Thus any material reduction in the profitability of the first and second quarters for any reason, including warmer than normal weather, generally cannot be made up by any significant profitability improvements in the results of the third and fourth quarters. Economic conditions could adversely affect our results of operations and financial condition. Uncertainty about economic conditions poses a risk as our customers may reduce or postpone spending in response to tighter credit, negative financial news and/or declines in income or asset values, which could have a material negative effect on the demand for our equipment and services and could lead to increased conservation, as we have seen certain of our customers seek lower cost providers. Any increase in existing customers or potential new customers seeking lower cost providers and/or increase in our rejection rate of potential accounts because of credit considerations could increase our overall rate of net customer attrition. In addition, we could experience an increase in bad debts from financially distressed customers, which would have a negative effect on our liquidity, results of operations and financial condition. We are subject to operating and litigation risks that could adversely affect our operating results whether or not covered by insurance. Our operations are subject to all operating hazards and risks normally incidental to handling, storing, transporting and otherwise providing customers with our products such as natural disasters, adverse weather, accidents, fires, explosions, hazardous materials releases, mechanical failures and other events beyond our control. If any of these events were to occur, we could incur substantial losses because of personal injury or loss of life, severe damage to and destruction of property and equipment, and pollution or other environmental damage resulting in curtailment or suspension of our related operations. As a result, we may be a defendant in legal proceedings and litigation arising in the ordinary course of business. The Company records a liability when it is probable that a loss has been incurred and the amount is reasonably estimable. As we self-insure workers’ compensation, automobile and general liability claims up to pre-established limits, we establish reserves based upon expectations as to what our ultimate liability will be for claims based on our historical factors. We evaluate on an annual basis the potential for changes in loss estimates with the support of qualified actuaries. As of September 30, 2018, we had approximately $72.1 million of net insurance reserves. Other than matters for which we self-insure, we maintain insurance policies with insurers in amounts and with coverage and deductibles that we believe are reasonable and prudent. that these levels of insurance will be available in the future at economical prices, either of which could have a material effect on our results of operations. Further, certain types of claims may be excluded from our insurance coverage, including the legal matter disclosed in Item 3 (Legal Proceedings – Litigation) of this Report. If we were to incur substantial liability and the damages are not covered by insurance or are in excess of policy limits, or if we incur liability at a time when we are not able to obtain liability insurance, then our business, results of operations and financial condition could be materially adversely affected. Our captive insurance company may not bring the benefits we expect. Beginning October 1, 2016, we have elected to insure through a wholly-owned captive insurance company, Woodbury Insurance Co., Inc., certain self-insured or deductible amounts. We also continue to maintain our normal, historical, insurance policies with third party insurers. In addition to certain business and operating benefits of having a captive insurance company, we expect to receive certain cash flow benefits related to the timing of the tax deduction related to these claims. Such expected cash tax timing benefits related to coverage provided by Woodbury Insurance Co., Inc. may not materialize, or any cash tax savings may not be as much as anticipated. Our results of operations and financial condition may be adversely affected by governmental regulation and associated environmental and regulatory costs. Our business is subject to a wide range of federal, state and local laws and regulations related to environmental and other matters. Such laws and regulations have become increasingly stringent over time. Some state and local governments have enacted or are attempting to enact regulations and incentive programs encouraging the phase-out of the products that we sell in favor of other types of fuels, such as natural gas. We may experience increased costs due to stricter pollution control requirements or liabilities resulting from noncompliance with operating or other regulatory permits. New regulations might adversely impact operations, including those relating to underground storage, transportation and delivery of the products that we sell. In addition, there are environmental risks inherently associated with home heating oil operations, such as the risks of accidental releases or spills. We have incurred and continue to incur costs to remediate soil and groundwater contamination at some of our locations. We cannot be sure that we have identified all such contamination, that we know the full extent of our obligations with respect to contamination of which we are aware, or that we will not become responsible for additional contamination not yet discovered. It is possible that material costs and liabilities will be incurred, including those relating to claims for damages to property and persons and the environment. In addition, our financial condition, results of operations and ability to pay distributions to our unitholders may be negatively impacted by significant changes in federal and state tax law. For example, an increase in federal and state income tax rates will reduce the amount of cash to pay distributions. There is increasing attention in the United States and worldwide concerning the issue of climate change and the effect of emissions of greenhouse gases (“GHG”), in particular from the combustion of fossil fuels. Federal, regional and state regulatory authorities in many jurisdictions have begun taking steps to regulate GHG emissions. For example in October 2015, the United States Environmental Protection Agency (“EPA”) published the Clean Power Plan for regulation of GHG emissions associated with the energy sector. Under the Clean Power Plan, the EPA will set state-specific goals for GHG emissions reductions, leaving the states with flexibility to determine how to achieve such goals. However, following litigation and subsequent EPA review of the Clean Power Plan, in August 2018, the EPA proposed the Affordable Clean Energy (“ACE”) Rule to replace the Clean Power Plan. The ACE Rule would establish emissions guidelines pursuant to which states would develop plans to address GHG emissions from existing coal-fired electric generating units rather than EPA setting state-specific standards under the Clean Power Plan and requiring states to develop plans using certain “building blocks,” such as “beyond-the-fence-line” conservation measures, to meet those state-specific standards. Public comments on the ACE Rule were due October 30, 2018. At this time, the final language, implementation, and any impact on our business of the ACE Rule is uncertain. Further, irrespective of federal legislation and regulation, individual states or cities may enact laws and regulations controlling GHG emissions. It is likely that any regulatory program that caps emissions or imposes a carbon tax will increase costs for us and our customers, which could lead to increased conservation or customers seeking lower cost alternatives. We cannot yet estimate the compliance costs or business impact of potential national, regional or state greenhouse gas emissions reduction legislation, regulations or initiatives, since many such programs and proposals are still in development. Our operations would be adversely affected if service at our third-party terminals or on the common carrier pipelines used is interrupted. The products that we sell are transported in either barge, pipeline or in truckload quantities to third-party terminals where we have contracts to temporarily store our products. Any significant interruption in the service of these third-party terminals or on the common carrier pipelines used would adversely affect our ability to obtain product. The risk of global terrorism and political unrest may adversely affect the economy and the price and availability of the products that we sell and have a material adverse effect on our business, financial condition and results of operations. Terrorist attacks and political unrest may adversely impact the price and availability of the products that we sell, our results of operations, our ability to raise capital and our future growth. The impact that the foregoing may have on our industry in general, and on our business in particular, is not known at this time. An act of terror could result in disruptions of crude oil supplies, markets and facilities, and the source of the products that we sell could be direct or indirect targets. Terrorist activity may also hinder our ability to transport our products if our normal means of transportation become damaged as a result of an attack. Instability in the financial markets as a result of terrorism could also affect our ability to raise capital. Terrorist activity could likely lead to increased volatility in the prices of our products. The impact of hurricanes and other natural disasters could cause disruptions in supply and could also reduce the demand for the products that we sell, which would have a material adverse effect on our business, financial condition and results of operations. Hurricanes and other natural disasters may cause disruptions in the supply chains for the products that we sell. Disruptions in supply could have a material adverse effect on our business, financial condition and results of operations, causing an increase in wholesale prices and a decrease in supply. Hurricanes and other natural disasters could also cause disruptions in the power grid, which could prevent our customers from operating their home heating oil systems, thereby reducing our sales. For example, on October 29, 2012, storm Sandy made landfall in our service area, resulting in widespread power outages that affected a number of our customers. Deliveries of home heating oil and propane were less than expected for certain of our customers who were without power for several weeks subsequent to storm Sandy. We depend on the use of information technology systems that could fail or be the target of cyber-attacks. Our systems and networks are maintained internally and by third-party vendors, and their failure could significantly impede operations. In addition, our systems and networks, as well as those of our vendors, banks and counterparties, may receive and store personal/business information in connection with human resources operations, customer offerings, and other aspects of our business. A cyber-attack or material network breach in the security of these systems could include the theft of proprietary information or employee and customer information, as well as disrupt our operations or damage our facilities or those of third parties. This could have a material adverse effect on our revenues and increase our operating and capital costs, which could reduce the amount of cash otherwise available for distribution. To the extent that any disruption or security breach results in a loss or damage to the Company’s data, or an inappropriate disclosure of confidential or customer or employee information, it could cause significant damage to the Company’s reputation, affect relationships with its customers and employees, lead to claims against the Company, and ultimately harm our business. In addition, we may be required to incur additional costs to modify, remediate and protect against damage caused by these disruptions or security breaches in the future. If we fail to maintain an effective system of internal controls, then we may not be able to accurately report our financial results or prevent fraud. As a result, current and potential unitholders could lose confidence in our financial reporting, which would harm our business and the trading price of our common units. imposed on public companies. If we are unable to maintain adequate controls over our financial processes and reporting in the future or if the businesses we acquire have ineffective internal controls, our operating results could be harmed or we may fail to meet our reporting obligations. Ineffective internal controls over financial reporting could cause our unitholders to lose confidence in our reported financial information, which would likely have a negative effect on the trading price of our common units. Conflicts of interest have arisen and could arise in the future. The general partner’s affiliates are not prohibited from engaging in other business or activities, including direct competition with us. The general partner determines the amount and timing of asset purchases and sales, capital expenditures, distributions to unitholders, unit repurchases, borrowings and reserves, each of which can impact the amount of cash, if any, available for distribution to unitholders, and available to pay principal and interest on debt and the amount of incentive distributions payable in respect of the general partner units. The general partner controls the enforcement of obligations owed to us by the general partner. The general partner decides whether to retain its counsel or engage separate counsel to perform services for us. In some instances the general partner may borrow funds in order to permit the payment of distributions to unitholders. The general partner may limit its liability and reduce its fiduciary duties, while also restricting the remedies available to unitholders for actions that might, without limitations, constitute breaches of fiduciary duty. Unitholders are deemed to have consented to some actions and conflicts of interest that might otherwise be deemed a breach of fiduciary or other duties under applicable state law. The general partner is allowed to take into account the interests of parties in addition to the Company in resolving conflicts of interest, thereby limiting its fiduciary duty to the unitholders. The general partner determines whether to issue additional units or other of our securities. The general partner determines which costs are reimbursable by us. The general partner is not restricted from causing us to pay the general partner or its affiliates for any services rendered on terms that are fair and reasonable to us or entering into additional contractual arrangements with any of these entities on our behalf. We could experience significant increases in operating costs and reduced profitability due to competition for drivers and equipment technicians’ labor. We compete with other entities for drivers and equipment technicians’ labor, including entities that operate in different market sectors than us. Costs to recruit, train and retain adequate personnel, the loss of certain personnel, our inability to attract and retain other qualified personnel or a labor shortage that reduces the pool of qualified candidates could adversely affect our results of operations. A substantial portion of our workforce is unionized, and we may face labor actions that could disrupt our operations or lead to higher labor costs and adversely affect our business. at any given time. There can be no assurance that we will be able to negotiate the terms of any expired or expiring agreement on terms satisfactory to us. Although we consider our relations with our employees to be generally satisfactory, we may experience strikes, work stoppages or slowdowns in the future. If our unionized workers were to engage in a strike, work stoppage or other slowdown, we could experience a significant disruption of our operations, which could have a material adverse effect on our business, results of operations and financial condition. Moreover, our non-union employees may become subject to labor organizing efforts. If any of our current non-union facilities were to unionize, we could incur increased risk of work stoppages and potentially higher labor costs. Cash distributions (if any) are not guaranteed and may fluctuate with performance and reserve requirements. the amount of cash taxes we have to pay in Federal, State and local corporate income and franchise taxes. Our substantial debt and other financial obligations could impair our financial condition and our ability to obtain additional financing and have a material adverse effect on us if we fail to meet our financial and other obligations. place us at a competitive disadvantage compared to our competitors that have proportionally less debt. If we are unable to meet our debt service obligations and other financial obligations, we could be forced to restructure or refinance our indebtedness and other financial transactions, seek additional equity capital or sell our assets. We might then be unable to obtain such financing or capital or sell our assets on satisfactory terms, if at all. We are not required to accumulate cash for the purpose of meeting our future obligations to our lenders, which may limit the cash available to service the final payment due on the term loan outstanding under our Credit Agreement. Depending on the timing and amount of our use of cash, this could significantly reduce the cash available to us in subsequent periods to make payments on borrowings under our Credit Agreement. Restrictive covenants in our Credit Agreement may reduce our operating flexibility. engage in other lines of business. These restrictions could limit our ability to obtain future financings, make capital expenditures, withstand a future downturn in our business or the economy in general, conduct operations or otherwise take advantage of business opportunities that may arise. Our Credit Agreement also requires us to maintain specified financial ratios and satisfy other financial conditions. Our ability to meet those financial ratios and conditions can be affected by events beyond their control, such as weather conditions and general economic conditions. Accordingly, we may be unable to meet those ratios and conditions. Any breach of any of these covenants, failure to meet any of these ratios or conditions, or occurrence of a change of control would result in a default under the terms of the relevant indebtedness or other financial obligations to become immediately due and payable. If we were unable to repay those amounts, the lenders could initiate a bankruptcy proceeding or liquidation proceeding or proceed against the collateral, if any. If the lenders of our indebtedness or other financial obligations accelerate the repayment of borrowings or other amounts owed, we may not have sufficient assets to repay our indebtedness or other financial obligations, including the notes. Under our Credit Agreement, the occurrence of a “change of control” is considered a default. We may be unable to repay borrowings under our Credit Agreement if the indebtedness outstanding thereunder is accelerated following a change of control. In the event of a change in control, we may not have the financial resources to repay borrowings under our Credit Agreement and may be unable to satisfy our obligations unless we are able to refinance or obtain waivers under our other indebtedness. We provide services to our customers in the United States in eighteen states and the District of Columbia, ranging from Maine to Georgia from 46 principal operating locations and 89 depots, 51 of which are owned and 84 of which are leased. As of September 30, 2018, we had a fleet of 1,251 truck and transport vehicles, the majority of which were owned, 1,306 service and 363 support vehicles, the majority of which were leased. We lease our corporate headquarters in Stamford, Connecticut. Our obligations under our Credit Agreement are secured by liens and mortgages on substantially all of the Company’s and subsidiaries’ real and personal property. fraudulent inducement claim. On October 10, 2018, the Plaintiff filed a second amended complaint. The second amended complaint attempts to replead a fraudulent inducement claim and is otherwise substantially similar or identical to the prior complaint. On November 13, 2018, Petro moved to dismiss the fraudulent inducement and unjust enrichment claims in the second amended complaint. Oral argument on Petro's motion is set for January 9, 2019. The Company believes the allegations lack merit and intends to vigorously defend the action; at this time we cannot assess the potential outcome or materiality of this matter. The following tables set forth the range of the daily high and low sales prices per common unit and the cash distributions declared on each unit for the periods indicated. As of November 30, 2018, there were approximately 236 holders of record of common units. There is no established public trading market for the Company’s 0.3 million general partner units. We are required to make distributions in an amount equal to our Available Cash, as defined in our Partnership Agreement, no more than 45 days after the end of each fiscal quarter, to holders of record on the applicable record dates. Available Cash, as defined in our Partnership Agreement, generally means all cash on hand at the end of the relevant fiscal quarter less the amount of cash reserves established by the Board of Directors of our general partner in its reasonable discretion for future cash requirements. These reserves are established for the proper conduct of our business (including reserves for future capital expenditures) for minimum quarterly distributions during the next four quarters and to comply with applicable laws and the terms of any debt agreements or other agreement to which we are subject. The Board of Directors of our general partner reviews the level of Available Cash each quarter based upon information provided by management. According to the terms of our Partnership Agreement, minimum quarterly distributions on the common units accrue at the rate of $0.0675 per quarter ($0.27 on an annual basis). The information concerning restrictions on distributions required by Item 5 of this Report is incorporated by reference to Note 3. Quarterly Distribution of Available Cash, of the Company’s consolidated financial statements. The Credit Agreement imposes certain restrictions on our ability to pay distributions to unitholders. In order to pay any distributions to unitholders or repurchase Common Units, the Company must maintain Availability (as defined in the fourth amended and restated credit agreement) of $45 million, 15.0% of the facility size of $300 million (assuming the non-seasonal aggregate commitment is in effect), on a historical pro forma and forward-looking basis, and a fixed charge coverage ratio of not less than 1.15 measured as of the date of repurchase. (See Note 12 of the Notes to the Consolidated Financial Statements—Long-Term Debt and Bank Facility Borrowings). On October 18, 2018, we declared a quarterly distribution of $0.1175 per unit, or $0.47 per unit on an annualized basis, on all Common Units with respect to the fourth quarter of fiscal 2018, paid on November 6, 2018, to holders of record on October 29, 2018. The amount of distributions in excess of the minimum quarterly distribution of $0.0675, were distributed in accordance with our Partnership Agreement, subject to management incentive compensation plan. As a result, $6.2 million was paid to the Common Unit holders, $0.2 million to the general partner unit holders (including $0.17 million of incentive distribution as provided in our Partnership Agreement) and $0.2 million to management pursuant to the management incentive compensation plan which provides for certain members of management to receive incentive distributions that would otherwise be payable to the General Partner. Note 4 to the Condensed Consolidated Financial Statements concerning the Company’s repurchase of Common Units during the three months ended September 30, 2018 is incorporated into this Item 5 by reference. The selected financial data as of September 30, 2018 and 2017, and for the years ended September 30, 2018, 2017 and 2016 is derived from the financial statements of Star included elsewhere in this Report. The selected financial data as of September 30, 2016, 2015 and 2014 and for the years ended September 30, 2015 and 2014 is derived from the financial statements of Star not included in this Report. See Item 7. Management’s Discussion and Analysis of Financial Condition and Results of Operations.